Our Polaris RZR XP UTV Roof in clear coated aluminum fits 2014-2015 Polaris RZR XP 900,1000, 1000 Turbo models. Constructed of durable lightweight aluminum, provides protection from the elements and a stylish design. Of course it offers easy and quick installation and includes all required hardware. As a result, protect yourself from sun and flying debris with our aluminum roof! 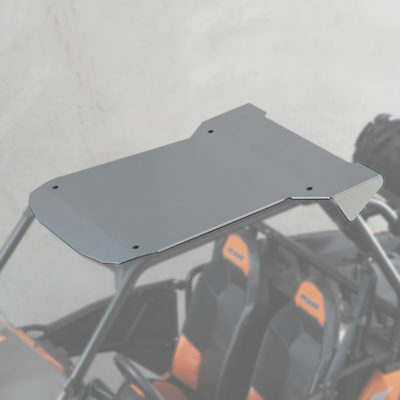 Rev up the comfort, protection and style of your Polaris RZR with this Aluminum Roof. It installs quickly and easily and provides shade and outstanding overhead protection. It features strong and durable 5051 aluminum construction and it blocks off-road obstacles as well as rain and sleet to enhance your riding experience. The roof is sealed 360 degrees to eliminate vibration.